I try to come up to this park several times a year in different seasons. It is a truly magical place. It's not very large, but it has an astounding diversity of plants. Many of the natives are found throughout the East Bay hills, but here you literally bump into them again and again. Here are the first blooms of the eponymous huckleberry. The buds are from lower down the canyon and the open blooms from up on the manzanita barren (drier and sunnier). Some rare and not so rare plants after the jump. I had a late cancellation for work today, so I decided to go up to the hills with my camera and take some pictures. It was a beautiful day after some rain this morning. I decided on Huckleberry Botanic Regional Preserve because I wanted to see some Ribes sanguineum in bloom and I was not disappointed. This one was right at the parking lot/entrance. There were several in flower throughout the preserve. And also several budding out. Some of the new leaves apparently come out of this flower like growth at the end of branches. I was reminded why this is one of my favorite plants. It was impossible to capture with my camera, but they have the most beautiful architecture. They have a elegant and delicate structure. If you look at the lighter colored leaves in the pics below, you can see one of the Ribes spreading out in its fashion. My ceanothus just bloomed for the first time. In honor of that a ceanothus post. Ceanothus blooms are rich in saponins, which produce lather when rubbed with some water. So basically ceanothus blooms make soap. I learned this the first time while doing the self-guided nature trail at Huckleberry preserve. I tried just a few flowers and produced a tiny bit of lather. Then I tried it for real on my Native Californians' use of plants walk at the UC Davis arboretum. The women leading the walk gave us each a scoop of dried ceanothus flowers and some water to wash our hands. It was a bit gritty, but left my hands feeling smooth and clean. So this winter I've decided to collect and dry some flowers for use while camping or backpacking. They also said the seeds made an even better soap. These blooms were gathered from a landscaped city park where they were protruding out towards the sidewalk. Since the plant is hedged I figured they weren't long for this world anyway. First off, I'm very happy to announce the first of the Western Columbine in the front yard (Aquilegia formosa) is blooming. It has two fully opened flowers and a bud about to open. This is one of my favorite flowers. Also both of the manzanitas are now blooming. I believe this one is Arctostaphylos bakeri `Louis Edmunds'. 2 of the 3 are in full bloom. Not too full since they were only planted a little over a year ago. And also the Ribes malvaceum is in full show. I'm very impressed with this little guy. The hardenbergia is finally busting out. 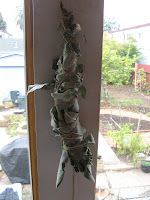 Thanks as always to Carol over at May Dreams Garden for hosting Garden Bloggers' Bloom Day. Here's two lupines. First is a miniature lupine (I think, though it might be a phlox) pushing it's seed pod off. The second is from a larger lupine that has blue and yellow flowers. Not sure about the name. Berries to be. Strawberries and Manzanita blooms about to open. I think I'm gonna try manzanita berry cider this year. A columbine seedling and several other things ready to grow. So this last Monday I went up to the Regional Parks Botanic Garden in Tilden to have a picnic lunch with a friend. The garden is 10 acres of California native plants and is really beautiful. It's stunning in the spring when most of the blooms are on display. But this time of year the stars are the manzanitas. 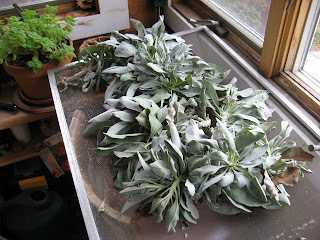 Drying white sage (Salvia apiana) from our front yard. We use it as incense and now in teas (infusions for the sticklers) as well.